The next war could well be in Lebanon. If it happens and it looks likely, it will not be a local war but a proxy war fought by Saudia Arabia (KSA) and Iran. KSA is spending billions of dollars on weapons from the USA and UK and not only for it’s on going war in Yemen. Israel will also support KSA in a proxy war against Hezbollah in Lebanon because of Hezbollah’s deep ties with Iran. Iran on the other hand has been buying weapon systems from Russia. Russia supports Bashar al Assad of Syria, who is very close to Iran. Can you see where I’m going here? A potential proxy war inside a proxy war. KSA vs Iran, the Sunni, Shia divide, Israel happy to see Iran caught up in a long drawn out war, expending resources, its enemies being weakened and unable to support the Palestinian territories in Israel, so it can continue to take over their land. USA supporting KSA and Russia supporting Iran, as both fight for influence in the Middle East. And people wonder why the global political system is so broken. It is run on a thirst for power and influence. ISIS in Iraq and Syria. Who is it good for? I know that many will disagree with what I am about to write here but I want to give you another point of view to think about. When you dig under the surface of what ISIS is doing you will see it is of huge benefit to certain countries. 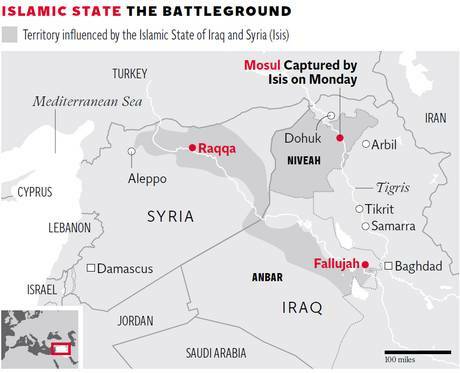 ISIS began their expansion in Syria, mostly in the north and east of the country. When the Free Syrian Army fought back against them in the winter, many ISIS fighters ran for cover in Syrian regime held areas before they were able to fight back and regain lost territory. Also, what is interesting is the fact that ISIS are not trying to push towards Damascus, rather they are trying to take over territory held by the FSA. They also paint their headquarters with their colours and have huge flags waving above, yet not once have they been bombarded by the Syrian airforce. So many of my contacts in Syria have told me about this. There is a lot of circumstantial evidence coming from the modus operandi of ISIS, that it is working in collaboration with the Syrian government, which itself is backed by Iran. If ISIS is collaborating with Bashar al Assad and Iran is his main supporter then there must be a connection, ISIS have to get their funding from somewhere and Saudi Arabia will not support a group which is helping Assad. Then we come to Iraq. The Shia majority government of Nouri Maliki is known to have very close ties to Iran. The last few years have been spent buying the latest military hardware from the USA so that it could defend itself after the US army fully withdrew. On paper it has, or should I now say had, a standing army of about 900,000, yet when fewer than 10,000 ISIS fighters advanced on Mosul, the second city of Iraq, they fled, leaving behind all their equipment and bases. They didn’t even try to resist, despite the huge advantage in numbers and weapons. Then at this time of crisis the government couldn’t even get enough votes to declare an official state of emergency. Neither did they ask the Kurds to send their well armed and experienced Peshmerga forces to help. Everything about this is suspicious. Considering how close Maliki is to Iran could it be that it was all a plan, a way of being able to arm ISIS with all the latest military hardware? But why would Iran, which is Shia, help an extremist Sunni group? The answer is simple, to create havoc and chaos in Sunni dominated areas. Over time you will see that ISIS will not concentrate on trying to capture Shia areas. Baghdad is mixed between Sunni and Shia so they may try to take it but it is unlikely. However, the south-east of Iraq is by far majority Shia, I will be very surprised if they try to push into this part of the country. It will give a further strong indication that they are working with Iran. Of course, to keep up appearances, Iran will make a show of helping Iraq to resist ISIS but it is more likely that Iraqi Sunni militias will be created from the remains of the army and other groups. It will end up similar to Syria, where the FSA while fighting the government, is also spending a lot of time trying to fight back against ISIS. The entire region will descend into a state of perpetual conflict, with only the Shia areas of Iraq remaining quiet. This is what Iran wants. The danger of using a proxy such as ISIS is that you have to keep control of it. Has Iran got ISIS on a short enough leash? Time will tell. The question that comes to my mind is why has this happened now? The simple answer is oil, or rather the price of oil. Over the last year, oil has spent a lot of time below $110 per barrel often closer to $105. The chaos created by ISIS has pushed the price up to $113 at the moment. Iran and Russia are very close, Russia has been using a lot of its cash reserves to prop up its banking system as capital flight increases, people and businesses are taking their money out of Russia. Oil and gas are the main sources of income for the Russian economy but it needs a price of about $117 per barrel to have enough to top up its cash reserves and keep the economy going. Could it be that Iran has arranged events in Iraq to help its closest ally Russia? Of course this helps all oil-producing countries but the main benefactor is Russia, it is desperate for cash and the events in Iraq could not have come at a better time. Iran also benefits greatly, the war in Syria has cost it a fortune as it supports Bashar al Assad, extra money is always needed. Of course Saudi Arabia also benefits but they already have a mountain of cash, the increased income while welcome will not really change anything for them. As I said in my previous post, Saudi Arabia is attempting to improve relations with Iran. It can see the coming tsunami of chaos which is about to engulf the region, I think it finally understands that Iran has the upper hand in what is going on. As a result I think we will see a deal between Saudi Arabia and Iran with regards to Syria, they will settle on a division of the country. In return Saudi will get assurances that ISIS will not invade, this has to be one of their greatest fears. ISIS could make havoc, especially as it now has a huge amount of modern American made military hardware. This all depends on Iran maintaining control over ISIS, if it loses control then all bets are off. The Islamic State of Iraq and Al-Sham (ISIS) had a huge win a couple of days ago. They were able to enter with out opposition, the Iraqi city of Mosul. Such is their fearsome reputation that the Iraqi army there abandoned everything and fled, leaving behind all their equipment, weapons and uniforms. Tens of thousands of Mosul residents, mostly Sunni, have fled and continue to flee the city to nearby Kurdish controlled areas. This is a major win for ISIS. Under the strict control and command of Abu Bakr al-Baghdadi, what started as a small splinter group after its ejection from Al Qaeda for being too bloodthirsty even for them, has grown over the last 2 years into a well-organized, trained and equipped army. The capture of Mosul extends their area of control and influence that holds in its deadly embrace large areas of both Syria and Iraq. See map graphic below. It is interesting that ISIS were allowed to develop in strength in Syria by Bashar al Assad. He wanted the civil war to become sectarian and helped them to grow. In this he has been very successful, however in so doing he allowed, for want of better words, a monster to develop. ISIS is causing worry in many countries in the middle east. This is why in Syria both Jordan and Israel are helping the Free Syrian Army (FSA) to create buffer zones along their borders, ISIS has intentions to take over most if not all Syria and many governments have finally woken up to the fact that their political games have led directly to the situation which exists today. Now on the doorstep of Europe is a very strong Islamic fighting force which is going to be hard to resist. It is difficult to see how Iraq will be able to deal with the situation. Although it has a large well equipped army of 900,000 soldiers, most of those are patronage jobs, they are there for the money and not because they want to fight. Add to this, the fact they have very little training in guerrilla warfare, which is the modus operandi of ISIS, and one has to consider the real possibility that ISIS will make further large gains in the country. It could be that the Kurds will send Peshmerga fighting units to fight ISIS in Iraq, they have a lot of experience in asymmetric warfare and will want to protect their regional capital of Arbil against any possible threat. This will not be the type of war where you can send in the air force to strike at well-defined targets, ISIS operate very much in a hit and run style, they are very good at disappearing while at the same time holding control. They really have become masters of psychological warfare as demonstrated by the huge exodus from Mosul by both the army and civilians. They are known as heartless butchers and their reputation precedes them wherever they go. Looking at what their ultimate goals might be could also give a possible explanation for other developments in the middle east. ISIS believe they have a god given mission to set up an Islamic caliphate, one that would rule very harshly based on their narrow understanding of Islam. This religious caliphate would ultimately need to have Muslim holy sites such as Mecca at its centre. With rapid growth in strength and territory of ISIS over the last 2 years and with no sign of them slowing down, Saudi Arabia must be starting to worry that they will come into the cross-hairs. Saudi Arabia has a well equipped army but to be honest has no fighting experience and most of its commanders wouldn’t have a clue how to defend the country as many have the job as a result of royal patronage, to be honest they are not up to the job. ISIS would see the country as a soft target. This could also explain why Saudi Arabia has recently been making peaceful overtures towards Iran. Iran is possibly the only country in the middle east which can deal with ISIS. There are many in Saudi who are totally against any rapprochement with Iran, for them it is their biggest enemy mainly because the Shia Muslims of Iran and the Sunni Muslims of Saudi see each other as religious heretics. The new Saudi Crown Prince Salman bin Abdulaziz al-Saud is a contentious figure among the Saudi royal family because he is willing to talk to Iran, publicly many members of the family are against him because they say his is not a legitimate heir but privately it must also be due to his stance on Iran. However they can’t say this too loudly as the ageing King also backs better ties with Iran and he could cut off the funds of many royals if they were to jeopardise his wish for better ties. The problem is that many don’t realize the threat ISIS could pose to their comfortable existence, few have ever done any real work, they simply live off the oil wealth of the country, out of touch with reality. The main sticking point in Saudi/Iran relations is their support for opposing sides in Syria. Iran supports the government of Bashar al Assad, it has committed huge resources in what is a very expensive war, not only financial but also in manpower. Saudi Arabia supports the Sunni revolt, Sunni are the majority of the population but with nearly half the population now displaced the Sunni majority is greatly reduced. The fact that ISIS is a rapidly growing problem in Syria and Iraq could lead to the 2 countries making some sort of compromise in Syria so that they can confront ISIS together. You can be sure Iran does not want to see Mecca in the hands of ISIS any more than Saudi Arabia does. This situation also plays into the hands of Iran, if Iran is to lead the fight back against ISIS then it will also expect to be recognised as the leading power in the middle east, which has been its intention all along, its hegemonic ambitions are hardly a secret. Could it be that Iran secretly supported ISIS even though it is Sunni? Bashar al Assad has certainly done so in Syria and he is backed by Iran. Once a deal is done between Saudi Arabia and Iran over Syria this could be the moment Iran steps in to confine ISIS in the areas it generally holds now, both in Syria and Iraq. Saudi will be forced to accept Iran as the dominant power in the middle east. With ISIS being so close to the Turkish border it could also be the moment that Turkey steps in the create a buffer zone in northern Syria probably working in conjunction with the Kurds with whom it now has a better relationship. In Syria, this will leave areas of permanent warfare in the north and centre of the country between Syrian rebel militias and ISIS. In the south and east of Syria there is bound to come a time when the rebels know they can’t advance any further towards Damascus, it is too well supported by Iran and Russia so will settle for a semi autonomous area buffering Israel and Jordan and supported by those 2 countries against any threat from ISIS. Bashar al Assad will be weakened but still in power which will suit Israel perfectly. Syria will be divided. As for Iraq, ISIS will hold power in certain Sunni dominated areas which is going to create yet another enormous refugee crisis. I wonder if ISIS realise how much of a pawn they are in this bloody game of chess. It will certainly resist any attempts at confinement. I’m sure the eventual plan is to reduce its power, which will lead to all sorts of other complications, there are always consequences. For the moment ISIS is being allowed to go from strength to strength as part of the bloody games being played in the middle east. To be honest this is such a huge topic it is impossible to cover all of it here. I am concentrated on how Syria is at the center of international Geo-political strategy. It has to be said that anything that can reduce nuclear weapon development has to be a good thing. Why on earth we need them at all has to be the question, if ever they were used anywhere in the world, the consequences would enormous. So we come back to the Iran deal. Iran has been suffering under sanctions for a while now and the impact on its economy is heavy. Not only that, it is costing a lot of money to continue its military support of the Assad regime in Syria and also Hezbollah in Lebanon. Estimates put the cost of this support at somewhere in the region of $1 Billion per month. Iran is playing a clever game, they agreed to stop Uranium enrichment in return for the lifting of sanctions, which will allow them to sell their oil on the open market. What is interesting is how quickly they agreed to this. This suggests that they already have enough enriched Uranium to make a bomb, the hard part is building a deliverable weapon. So agreeing to this demand would not have been difficult for them. In any case, supporting Assad is a much greater priority for them now than the building of a nuclear weapon. So why is Iran supporting Assad? Basically it comes down to the fact that Iran is trying to grow its sphere of dominance in the middle east. When Bashar al Assad became president he allowed Iran to have much more influence in the running of Syria than his father ever did. The Assad regime is the only one that will allow Iranian influence in Syria, in fact, now the Assad regime is so much in debt to the Iranians that it is little more than a vassal power that represents Iranian interests. If Assad were to go, Iran would lose this influence and its arm that reaches all the way to the Mediterranean sea via Iraq to Syria and Lebanon. Hence it agreed to the nuclear deal as it needs the money to fight to keep Assad in power. I suggest you read this interview I made with Zaid Tlass, a senior air-force General and whose family was very close to the Assad family before they defected, to get more info about the regime and Iran. Syria is now at the center of Geo-political games being played out by various countries. On the one hand you have Iran supporting Assad directly, and indirectly through Hezbollah as well as through various militias. There are also lots of Shia fighters from Iraq who are going to Syria in order to protect Shia holy shrines, it must be said though that they are not there to support Assad directly as his Baathist regime is very much like that of Saddam Hussein’s time in Iraq, which for obvious reasons doesn’t hold good memories for Iraqis. These Iraqi Shia fighters go because they get well paid and are able to support their families back in Iraq where economic conditions are terrible for many despite the vast oil wealth of the country. So Iran is paying poor Iraqis to go fight in Syria. Al Qaeda is a rapidly strengthening force in Syria. When I was there back in the spring they really were not a problem, being very few in number. The last few months have changed all that. Now Syria is the number one place for them to go, they even call it a 5 star Jihad. Jihadii from all over the Muslim world are making their way to Syria to join Qaeda Although still far fewer in number than the moderate FSA, Qaeda are much better equipped and funded and working hard to take control of the north of Syria away from the FSA. In fact now the FSA has 2 battles on its hands, against Assad and against Qaeda. It has been suggested to me by some FSA commanders that they would even consider working together with certain Shia militia to fight together against Qaeda as it is a mutual enemy before continuing to fight each other. I know many of you reading this will find it hard to understand but it this how the middle east has worked for a very long time. I would be very curious to see what might happen if the moderate Sunni and Shia joined forces to fight them. They might realize that they can actually get on together, who knows. They are really worried about Qaeda, if they were to take control it would not be enough to be a good Muslim, not smoking or drinking and praying five times a day. No, nor would it be enough to stay quiet and let Qaeda run the country. No,Qaeda would expect the people to join them, when I say join them I mean as fighters. If you refuse, you are seen as a traitor and they will kill you, as simple as that. If they get control of the country, the people will be forced to become fighters to be sent to other countries. If you are not with them 100% then you are the enemy. This is why the moderate Sunni rebels are prepared to consider making some unusual alliances. What is interesting is that Qaeda are getting a lot of their heavy weapons from Libya. To get these weapons to Syria they have to be brought by sea and then landed in Turkey from where they make their way across the border. Smuggling large quantities of heavy weapons through a shipping port is no easy matter, particularly as the Turkish know what Qaeda are up to. But the fact is Qaeda are able to do this, which leads to the conclusion that Turkey is turning a blind eye to the situation and if Turkey know about it then you can be sure the USA knows about it too. So what is going on here, why would they allow this to happen? This is my opinion based on my observations and interviews during a month in Syria and another month visiting Jordan and Lebanon, including refugee camps. It appears that Qaeda are being allowed to build up their strength and resources in Syria. In fact, Syria is being made to look such an attractive Jihad that as many Qaeda and associates as possible will go there to fight. They are leaving Pakistan and Afghanistan as well as Europe and the USA in droves, all heading to Syria, well equipped, well funded, ready to fight and die. Obviously, in the face of this, Iran is going to have to increase the resources it puts into keeping Assad in power. As I said before, this war is costing Iran a fortune and it is going to get much more expensive for them as Qaeda get stronger. This is why Iran agreed to the nuclear deal and the USA knows it. The strategy of the USA is to get Qaeda and Iran to fight each other to exhaustion in Syria. Let Qaeda and Iran build themselves up so they can have a proper war inside Syria and really try to wipe each other out.Not that the USA or others are looking to see Iran as a country destroyed but rather that its expansionist ambitions are severely curtailed. As a result, this war is going to continue for some time and Syria as a country will be reduced to rubble even more than it is now. Of course, no thought is given to the ordinary Syrian people who continue to suffer terribly as a result of this Geo-political strategy. Then we have Turkey. They are playing the long game. Like Iran they also have expansionist ambitions that hark back to the days of the Ottoman empire. At the moment they are biding their time, allowing Qaeda to build up its strength in Syria for its fight against the Iranian owned Assad regime. The plan is that when Iran and Qaeda eventually exhaust themselves and the land is left in ruins, the few Syrians who are left will not be able to put up any resistance as Turkey annexes the northern territory of Syria. Syria as a country will cease to exist in the form we know it today. However, Turkey isn’t the only country with ambitions to have a slice of Syria. Jordan is also playing its own games. The supply of weapons that are sent to the FSA in the south of Syria from countries such as Saudi Arabia and Qatar all come through Jordan. However Jordan doesn’t pass on all the weapons that are destined for the FSA. It feeds through just a little, enough to keep the FSA fighting but no more. Also sometimes they play games such as mixing tracer rounds with standard ammunition. Tracer rounds give away your location when used and makes it easier to target you at night when fighting takes place. I was given this information directly by an FSA General. Jordan is also trying to get the different rebel fighting brigades under their control. Let me explain how. There are many defected Syrian regime military officers now in Jordan. Some defected because they are against the regime but other simply because they were able to get their family and money out of the country and be able to protect their personal interests. Jordan has been trying, not very successfully at the moment, to insert these defected Syrian officers into the various rebel brigades, the largest of which in the south of Syria is the Liwa al Yarmouk brigade led by Bashar al Zoubi who I have met a couple of times in his home and also met Yasser al-Abboud who was the General before he was recently killed. Anyway, the Jordanian idea is to dilute the authority of the FSA rebel commanders and bring them under their control. I know this as this is what many told me including Bashar al Zoubi and quite often the Jordanians will only give them supplies if they accept certain demands. This includes being told where they can and cannot attack. Obviously Jordan is working closely with the USA and the rebels being told where they can and cannot attack is a strategic decision that has as its ultimate aim the division of Syria also in the south. Let me explain why the ultimate objective is a divided Syria. So done, Syria will be a shadow of its former self and an Iranian controlled Assad regime can never be a threat to Israel. Jordan will never invade Syria to take control of the land in the south. What will happen is that as the Sunni, Shia and Regime forces fight each other to destruction in the north and center of the country, Jordan will offer nationality to those Syrians in the south and with it protection. In return Jordan will get access to the vast ground water resources that it so desperately needs. Before this can happen Jordan will eventually have to get rid of the various brigades leadership and replace them with their own selected people from among the the defected Syrian officers who are part of the Syrian military council in Amman run by Colonel Achmed al Namah. One final point, at the moment there isn’t a big problem with Qaeda and other extremist factions in the south but if there were then Jordan would give direct help to the FSA to help defeat them. After, Jordan would continue with its original plans. In a word no. Short of a nuclear strike, Iranian facilities are so well buried under mountains that attacking is impractical and fraught with risk. Iran has very good Russian made air defense systems, which means that there is no guarantee a strike would work. Saudi Arabia simply doesn’t have the military capability to make such a strike. Only Israel could conceive of such an action but they wont. In the end it will not be necessary if all goes according to the plan of getting Qaeda and Iran to fight each other to exhaustion in Syria. And there are always cyber attacks to be used as a way of damaging Iranian infrastructure. Any talks in Geneva will be fruitless. The rebels refuse to negotiate with the regime and also the moderate rebel commanders who have the power on the ground in Syria have not been included to take part. Those Syrians who claim to be the opposition are hardly recognized by the people on the ground. It makes no sense for there to be talks if Iran isn’t there because it is they who control Assad. Seeing as Iran is prepared to throw everything it has into keeping Assad in power any talks will be pointless. I often hear people say that what happens in the middle east is nothing to do with them. Why should they care about a war far away between people who have different language, culture and religion be of any concern to us in the West. The fact is there is an indirect effect and it is a powerful one that effects us every day. The threat of terror and terrorist organizations and individuals are used as a reason for ever more surveillance of society. It has arrived at the point where all electronic communication is monitored. This mass monitoring of individuals has less to do with terrorism but rather with these organizations finding ways to justify their existence and growth. Allow me to explain. It is interesting that when we look at different types of organizations, from charities and political parties to Intelligence services, they all have some vital things in common. They all start out with an objective and all the organizational effort is put into reaching the objective for which it was created. So a charity that looks after animal welfare or an intelligence organization that is tasked with protecting the country. As the organization becomes more successful it finds that its political and financial power increases as it grows in size and influence. What invariably happens next is a result of some interesting psychology. The organization develops an institutional mentality. What this means is that the continued growth and recognition of the organization becomes more important than the job it originally set out to do. This is also the time when those who are a part of the organization have to be much more conformist if they wish to continue working there. Internal rules and regulations become more important than the actual job. Creativity of thought and action is suppressed. Along with this you also have empire building within the organization as it moves from internal collaboration to protecting and developing internal power. So we come back to the intelligence services. We see how they have become institutionalized. The report into the 9/11 attack shows that there was a lot of evidence beforehand of a planned attack and the report criticized the security services because of their internal conflicts of interest. The existence of the organization has become more important than its stated job. Internal empire building will mean that different elements will look for ever increased funding as they consolidate their positions. They are in competition with each other rather than genuinely collaborating. In order to justify increased funding they need to show two things; their successes, terrorist attacks they have stopped and their failures, it is the failures that will be used in combination with the success to ask for more money. If only we had more money for more resources then we could have stopped that particular attack. So actually it serves the purpose of the intelligence services for there to be a high profile attack from time to time. I would say that the point has been reached where no matter how much money and new technology is pumped into security services the returns, stopping terrorist attacks, will be very much reduced due to ossifying institutionalization. In the meantime, in combination with Geo-political strategy we see how the lives of ordinary people are counted as nothing, where governments consider their own citizens to be the enemy to be watched at all cost in case they try to change things. Throughout human history we have tried pretty much every form of government that can be conceived. The track record isn’t good. What we are seeing now though is an ever greater disconnect between governments and the people they claim to govern. Governments are getting ever harder, iron-like and also more distant while the population is seen as something clay-like, to be molded and squeezed. The problem is that iron and clay really don’t mix and it wouldn’t take much to break that fragile bond. There is a lot more I can say about this but it will wait for another time.